A Dental Implant is an artificial tooth root made of titanium and can be an excellent long term option to replace a missing tooth. Dental Implants can also be used to anchor down dentures and act as a more stable base, particularly in the lower arch. 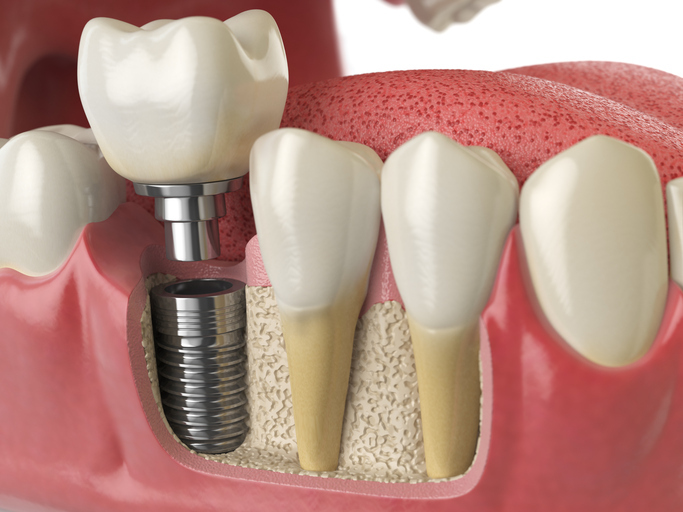 The Dental Implant process typically involves the insertion of the titanium screw into the missing tooth location. The titanium screw then integrates and fuses with your bone over the next 3-6 months. Once integration is complete, an abutment is placed to attach the titanium screw to the dental crown, completing the process. Utilizing modern technology, Dr. Kim digitally designs your implant placement by fabricating a surgical guide for more accurate and rapid placement with minimal pain and faster healing process. If you’re tired of loose fitting dentures or have been told that you will be losing all your teeth, All-on-4® is an alternative treatment solution that will provide you a stable set of teeth the same day. All-on-4® is a set of fixed teeth anchored to implants. Dr. Kim provides complimentary implant consultations and will discuss tooth replacement options to help you make the most informed decision. Make an appointment with Dr. Michael Kim, so he and his dental team can explain more to you about Dental Implants, and other options you may want to consider.